Heidi Schreck’s flawless, moving play is a how-to guide for political theater. Christian Lewis reviews. Lately, some of the most frequent words to come up in theater reviews are “timely” and “relevant.” In this repressive political landscape, we are all debating what kinds of theater we need right now and what theater can do for us. 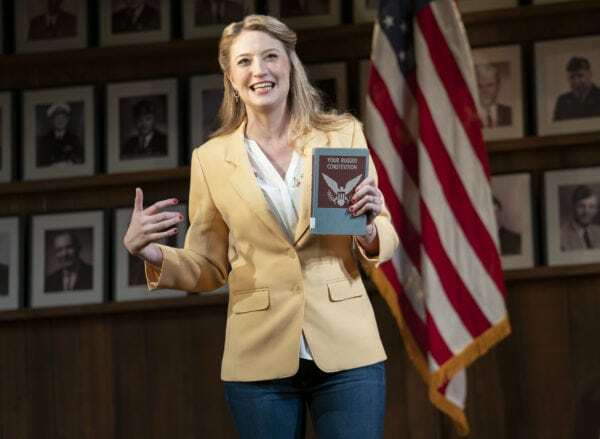 Thankfully, Heidi Schreck’s What the Constitution Means to Me, now at the Helen Hayes Theater, answers those questions, masterfully taking up the torch of political theater and guiding us into the future. It has created a new standard of just what “timely” and “relevant” can mean for theater. This piece, which Schreck wrote and performs, is a beautiful, amorphous exploration of constitutional law, the judicial system, and the oh-so important concept of equal rights for all. The inspiration here is an oration contest at the American Legion that Schreck competed in as a teenager to win prize money for college. In the contest, speakers have to make an argument about the Constitution and then expound on a single amendment, chosen at random out of a can—and most importantly, they have to make personal connections, which is exactly what Schreck does in this play. For a large portion of the piece, she plays her fifteen-year-old self competing and giving her speech on how the Constitution is “a crucible,” with Mike Iveson as her legionnaire time keeper. She intersperses her speech with more adult anecdotes about her life and her family history, always bringing it back to specific moments in the Constitution, such as the “penumbras” of Amendment Nine. She covers a great deal of legal history, providing compelling summaries of Dred Scott v. Sanford, Griswold v. Connecticut, and Roe v. Wade; she weaves the personal and political in such seamless ways that this never feels like a civics class, but instead like a compelling story you can’t wait to hear the rest of. The entire play is miraculously fluid in all the best ways. It begins with the house lights on and Schreck calmly stepping on the stage to greet us; it seems almost like a pre-show announcement, you don’t even realize the show has begun. She continues talking and the lights slowly dim, drawing you in. This impeccably executed first moment is a perfect metonym for the piece as a whole, which subtlety pulls you into its world. Just when you think you know exactly how something is going to go, Schreck brings you somewhere equally unexpected and extraordinary. In addition to proving just how much she loves (or loved) the Constitution, Schreck emotionally tells the story of several generations of women in her family who have dealt with abusive partners, a lack of legal rights, and the violence of patriarchy in general. To end the evening, we are treated to a live debate, where Schreck faces off against a high schooler; at the performance I saw it was the brilliant and quick-witted Thursday Williams. They flip a coin to see who will argue to keep the Constitution and who will advocate getting rid of it. A random audience member decides the winner. Although the talking points are planned in advance, a portion of this is made up by the opponents on the spot, which is part of what makes this play so deeply human. Here, and throughout the play, it feels like Schreck is ad-libbing the entire piece. Everything always feels personal and emotionally motivated, as if she was telling it for the first time—this is what proves that Schreck is a master story-teller, not to mention a Constitutional law expert and professional debater. Schreck deserves tremendous praise for every element of this bold endeavor, as does her director, Oliver Butler. What the Constitution Means to Me is a guidebook in how to do political theater and an exemplary example of the power of theater. It is a flawless, moving, and incredibly powerful masterpiece. Although this is not the first work on Broadway with a mostly-one person cast that is spreading a political message, it is quite clearly the best. I left the theater not only with a pocket copy of the Constitution, but with a newfound understanding of this document, both what is in it and what has been purposefully left out. For the first time in quite a while, I actually feel hopeful about the future, and that is thanks entirely to Heidi Schreck.